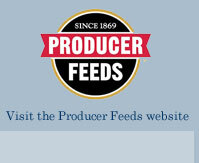 A mineral-vitamin premix for free-choice feeding or mixing in feed for beef and dairy cattle. Non-medicated. Qualifies for production of natural beef free of hormones or additives. Calcium d-pantothenate, monocalcium phosphate, calcium carbonate, salt, magnesium oxide, potassium chloride, processed grain byproducts, zinc sulfate, copper sulfate, manganese sulfate, ethylenediamine dihydriodide, cobalt carbonate, cobalt sulfate, molasses products, mineral oil, vitamin A supplement, vitamin D3 supplement, vitamin E supplement, sodium selenite, yeast culture, artificial color. For free-choice feeding to beef cattle. Place in covered mineral feeders or troughs located near the animal’s water supply, shelter or loafing area. Offer one feeding station for each 15 head. Ensure that small calves can easily reach the trough. Maximum trough height should be 20 in. Fill feeders with a quantity of mineral that will be consumed in seven days. DO NOT FEED ADDITIONAL SALT OR MINERALS. CAUTION: 4 oz. of this mineral provides 3 mg. selenium. Feeding higher levels of selenium is not permitted.